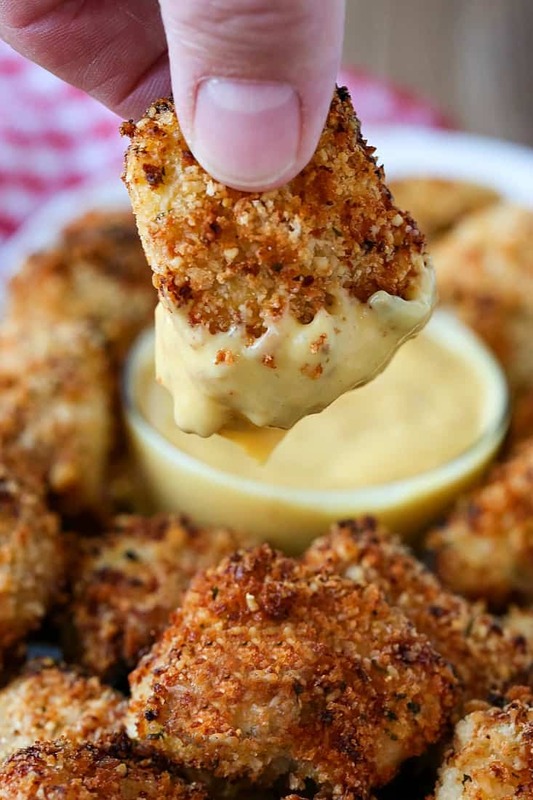 These Air Fryer Chicken Nuggets are so crispy, you’ll never know they aren’t deep fried! 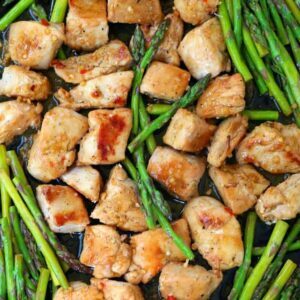 This delicious, easy chicken recipe only has four ingredients! 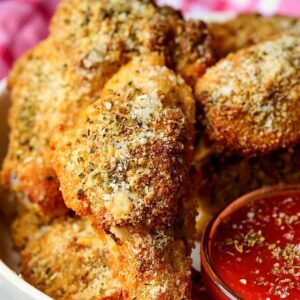 We’re just starting to cook with our air fryer but if you like lighter chicken recipes, try Slow Cooker Crispy Carnitas or these baked Chicken Parmesan Chicken Wings! 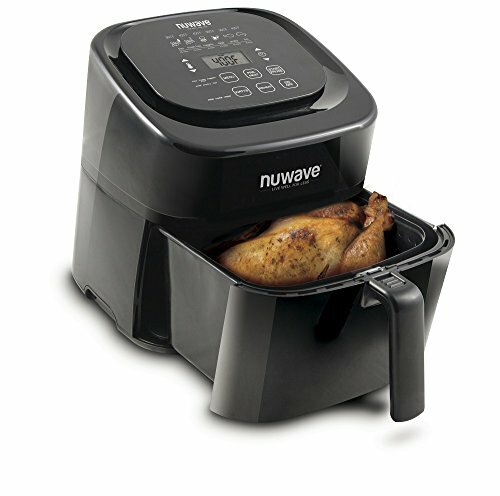 So we just got on the air fryer bandwagon, and we like it. This chicken recipe came out so perfectly crispy, we could even believe it! Our kids loved them (WIN) and we loved them too. The best part is that there’s only four ingredients, so it’s pretty easy to have everything on hand! All you need is a bottle of Italian dressing, parmesan cheese, bread crumbs and of course, the chicken. We used boneless, skinless chicken thighs but you can definitely use chicken breast. Chicken thighs aren’t going to be as dry as a chicken breast but the marinade will help with that, too. Can I Make These Chicken Nuggets In The Oven? Yes, you definitely can. Use a rack to place over a baking sheet, spray the chicken with cooking spray and bake in a 425 degree oven for 15 minutes, flipping once in between cooking. I have to tell you, they come out SO much more crispy in the air fryer. They really do. But the oven will do the trick! 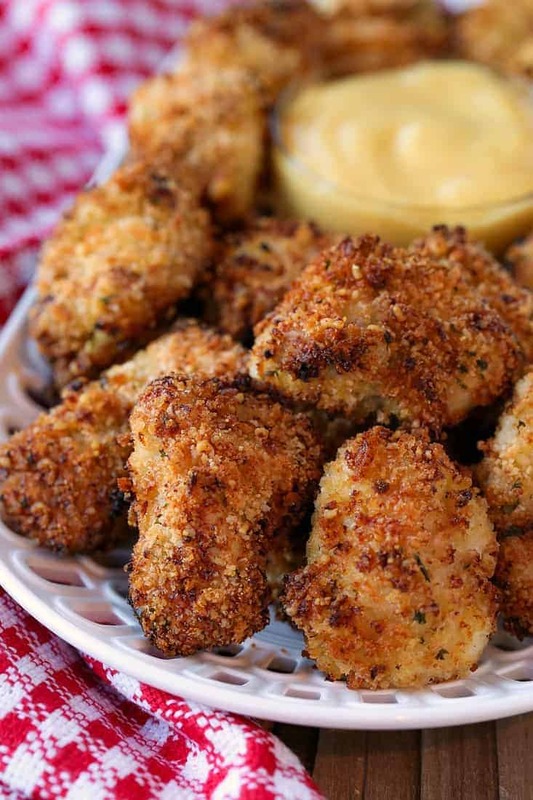 We love dipping these chicken nuggets in honey mustard sauce! You can buy your favorite bottle from the store or you can use a homemade version like we have in these Honey Mustard Taquitos. 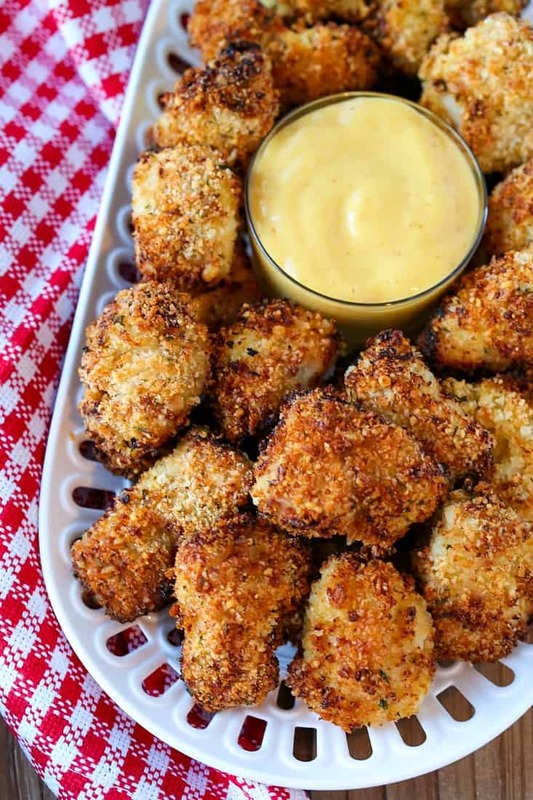 Another great dipping sauce for these chicken nuggets would be our Awesome Sauce, if you’ve never tried that do head on over and check it out! You can switch up the simple marinade here and try something different, too! Use your favorite chicken marinade (even a bottle of your favorite dressing!) or a simple balsamic vinegar and olive oil marinade. 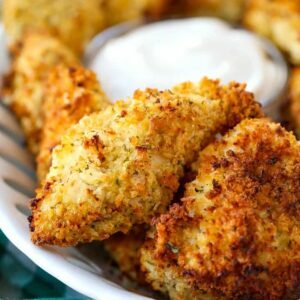 Using half and half parmesan cheese to breadcrumbs gives these nugget such a great flavor, but if you have all breadcrumbs you can use that too. These Air Fryer Chicken Nuggets are still going to be so much better than the frozen kind. Can You Freeze These Chicken Nuggets? Oh yes, we make big batches of this chicken nugget recipe and freeze them for an easy dinner. To reheat, preheat your air fryer to 375 degrees and then cook the frozen nuggets for 10-12 minutes until warmed through. To reheat these nuggets in the oven, place them in a 400 degree oven for 15 minutes, flipping once during cooking. 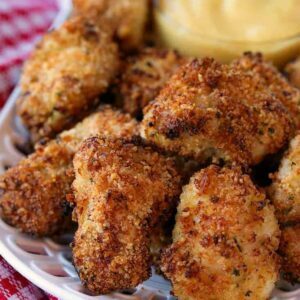 These super crispy air fryer chicken nuggets are going to be a hit with the whole family! Marinate the chicken pieces in the dressing for at least 2 hours or up to overnight. Remove the chicken from the dressing (discarding the dressing) and place on paper towels to dry off the dressing. Add the beaten eggs to a shallow dish. Mix the parmesan cheese and the breadcrumbs together in another dish. Dip each piece of chicken into the egg wash, letting the excess drip off and then into the parmesan/breadcrumb mixture to coat. Repeat with all of the chicken. Preheat your air fryer to 400 degrees. Spray the baking racks of your air fryer with cooking spray, then add the chicken nuggets in a single layer onto the racks. 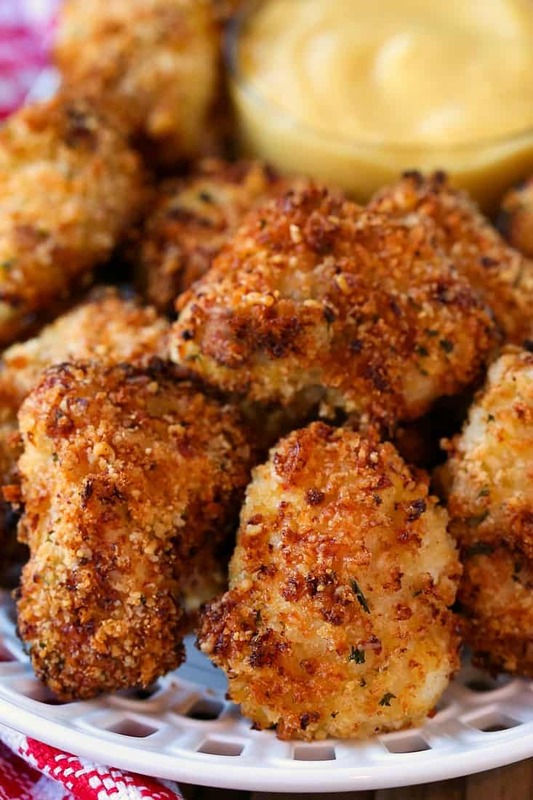 Spray the tops of the chicken nuggets with cooking spray then place into the air fryer. Cook for 8 minutes until brown and crispy, take a piece of chicken out to make sure it’s cooke through completely then remove the nuggets from the air fryer. Serve with honey mustard, BBQ sauce or ketchup!